We gather in the early morning at Toquaht Bay. Upon your arrival, we will show you how to effectively pack your belongings into your kayak. We'll spend time familiarizing you with your kayak as well as introducing basic paddling skills, and safety procedures. Once we launch we’ll make sure you are comfortable and secure before setting off into the waters of Barkley Sound. From Toquart Bay, we set a southeasterly course taking us towards the inner Broken Group Islands. These quiet islands have a colourful and interesting history. Watch for traces and clues to the lives of rumrunners, lonely hermits, and ship wrecked bank robbers. Paddling to a protected sandy cove on Hand Island, we make our first stop. Take a stroll or just sit back and take in the scenery as we prepare lunch. Looking back towards Vancouver Island you'll notice the jagged peaks of the Victoria Range Mountains rising almost from the ocean. Continuing on in the afternoon we navigate towards the outer Islands and make our camp at one of the designated Parks Canada camp sites. If there is time after establishing our camp we may plan a late afternoon paddle or relax on the beach of our new Island home. Later in the evening after dinner, we'll gather around the campfire to enjoy a mug of hot chocolate and our first West Coast sunset. Awake to the smell of organic coffee brewing on the camp stove, the sounds of awakening birds, and sunlight streaming through the forest. After breakfast, if the tide is low, we'll investigate the intertidal pools in front of our camp. Patience and a keen eye will reveal many wonderful creatures and their variety of adaptations that allow them to flourish despite the extremes of shifting tides. 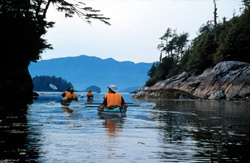 The waters of Barkley Sound also provide excellent learning opportunities for kayakers. If you already have some experience, you may wish to improve your paddling techniques, seamanship skills, or wilderness camping skills.. You may be interested to learn how to interpret marine chart information, read tide tables, or how to navigate with a compass. Today, with lighter boats, we’ll meander around the smaller islands of the archipelago. 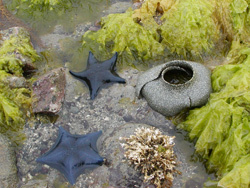 The kayaks are perfectly suited to gliding through narrow passages with the sea floor just inches below our boats or crossing channels to reach exposed rocks covered with brilliant sea stars. The distance we cover each day is dependent upon the abilities and interests of the group, as well as weather conditions. We typically schedule about two hours of paddling before stopping for a stretch or snack. A longer break at midday gives us time to prepare a fresh lunch, and for you an opportunity to explore ashore. Often we elect to stay in the same camp for the duration of the tour and plan day trips to different areas of the park, utilizing the time saved in breaking down and setting up camp to our advantage. Weather and sea conditions permitting, we will paddle to the outer Islands of Clark, Benson, Wouwer and Effingham. The landscape is very dramatic from years of exposure to the force of the Pacific Ocean winter winds and waves. 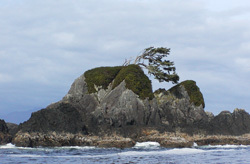 Twisted, wind swept trees cling to the shores, and we'll find sea caves and arches formed from solid rock, but behind these islands a maze of more protected waterways also provides exciting and beautiful sea kayaking opportunities. Be on the lookout for marine creatures such as Gray Whales or even transient Killer Whales cruising by. A nearby Sea Lion colony provides plenty of excitement. The barking and roaring of these creatures can be heard for miles and we often spot them cruising or hauled out on rocks sunning themselves. 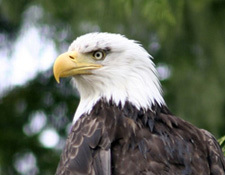 Over two hundred varieties of birds spend time in nutrient rich Barkley Sound. We may be fortunate enough to spot rare migrants among the more common sea birds. Evenings are often spent together conversing, playing games or telling stories. Just a few days of camping with like minded adventures always results in good fun, and often in long term friendships. When conditions are right and safety is assured, we may venture out for a night paddle. If you've never experienced paddling in bioluminescence, under dark starry skies, you are in for a treat. Today we begin the return journey to Toquaht Bay. The ability of the kayaks to quietly and safely reach so many interesting shores is what makes the Broken Group Islands so popular as a paddling destination. The quiet strength of the rainforests, the beauty of the scenery and the peaceful rhythm of your paddle will have you captivated. Throughout your stay in the Broken Islands, we assist you in refining your paddling technique so that by the end of our tour you will feel confident in your abilities. We plan our return to Toquaht Bay for between 3:00 -4:00 PM. This allows plenty of time for our guests to return to Nanaimo to board ferries to the mainland or perhaps continue on to visit other areas of Vancouver Island. Itineraries are intended to describe the experience you can expect from your sea kayaking adventure with us. Pacific Northwest Expeditions reserves the right to change the itinerary without advance notice at the discretion of the guides, due to weather conditions, tides and currents, activities en route or other logistical situations at the time of the trip. Pacific Northwest Expeditions is committed to consistently operate trips of high quality and safety without compromise. Customizing this trip to accommodate a group of friends, family members or colleagues can be arranged for 8 people. We are happy to discuss your ideas or make suggestions.